We talk about printed ephemera on here quite a lot, but we've never really given much thought to what it is about it that really tickles our cerebellums. This ticket, which Gene picked up on some recent local travels, gave us pause, and made us consider why it is certain things grab our fancy. In this instance, as designers, we thought it was groovy because we're reading it as a typeface sample more than anything else. And as a typeface sample, it's just about the perfect format. If you'd designed a machine typeface, specifically for ticket machines, then sending it out to people in ticket format would exactly 'right'. 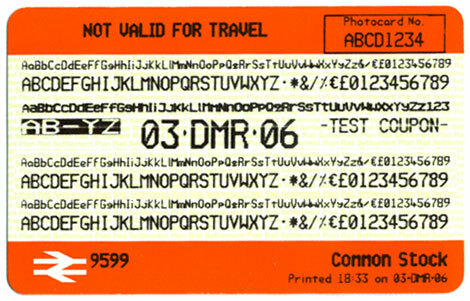 Of course, it wasn't designed to showcase the typeface at all; it's a mechanical byproduct, a piece of evidence coughed up by a ticket machine to prove that it's printing correctly. But, on a more general level, we liked the ticket because it's a fundamental visual icon for us. These tickets have been around for, well, at least fifteen years or so. Right now they're something we use daily, so we don't generally take time to consider them from an aesthetic point of view: their functional status as a travel permit takes precedence. But we can easily anticipate the nostalgia we'll feel once the design or format changes. Once they're no longer valid for travel.